The circle is not a formal counselling group rather a small, intimate space to begin conversations & build relationships. The circle is semi-structured with a brief welcome & intention setting exercise. You will be given an opportunity to share or simply sit back & listen. of us feel like our minds are always switched on, consumed by worries and fears, or varying degrees of anxious thoughts & feelings. Anxiety has become one of the most common mental health conditions in Australia with approximately 1 in 3 women and 1 in 5 men experiencing anxiety throughout their lifetime. Anxiety is more than just having an occasional anxious thought - this is normal from time to time or during periods of stress. Anxiety is when these anxious thoughts and feelings don’t go away, when they happen for no particular reason and make daily functioning difficult. 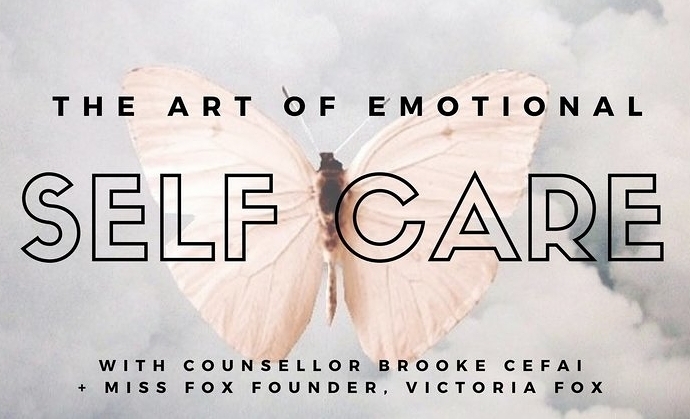 Join Counsellor Brooke Cefai & Miss Fox Founder Victoria Fox for a masterclass on mindfulness and positively managing anxiety. In these increasingly complicated times, it seems we have forgotten basic needs, like how to take care of and nature ourselves. Self-care follows the same principles as the air hostess announcement on a plane - “you must put your own oxygen mask on first before assisting others”. Only when we attend to our own needs can we be truly present and supportive of those around us.